.UPSC Civil Services Notification 2019 was out on 19th Feb 2019. This CSE Mains exam notification states total 800 IAS/IPS/IFS Vacancies including Various IAS Posts, IFS posts. Online form link is highlighted in this post at the end. At upsc.gov.in, registration can be done from 19th Feb 2019 To 18th March 2019. The Prelims exam will be on 02nd June 2019. Candidates can apply for this UPSC Civil Services Recruitment before the last date by checking the UPSC Civil Services Vacancy. For more details, candidates can check the official notification is mentioned on the last page. Check out the recently released UPSC Civil Services Notification 2019 for the Various IAS Cadre posts, IFS cadre post. So total posts in this UPSC civil Services notice is 800. The fresh job update of UPSC with respect to the most prestigious competitive exam in India is written in this post. The most useful details for the CSE Form filling candidates has been stated right at this moment. Read the full notification of this Central Government jobs in the form of this post. Yearly lakhs of postulants will wait for this CSE exam to get the job as an IAS/ IPS/IFS. If you are the one in that list of candidates, immediately notice this post. And then apply for this recruitment by checking the UPSC Civil Services Vacancy details. Indian Administrative Services-Candidates having Bachelor Degree in any discipline will be eligible for this Examination. Indian Forest Services: Candidates having Bachelor Degree in any one of from following Subjects-: Animal Husbandry & Veterinary Science, Botany, Chemistry, Geology, Mathematics, Physics, Statistics, Zoology, Agriculture in any stream from any recognized University/Institute will be considered for this Examination. For more details candidates can check the official notification. The salary details are mentioned in the official notification clearly. UPSC Civil Services 2019 Notification mentioned three separate notifications for IAS and IFS and also IPS have been released by the Union Public Service Commission on the formal portal i.e. www.upsc.gov.in. In the advertisement of the Civil Services exam, the recruiting posts are Administrative Services, Forest Service Posts. various are the IAS posts, IFS posts. Most of the aspirants will have a passion towards this exam, therefore they will prepare for this exam since from 1 year before the notification. Check UPSC IAS and IFS Recruitment 2019 separately at the end of this page. Candidates can fill the UPSC IAS & IFS Online Application Form. For Employment News you can check here. This UPSC Civil Services Prelims Notification released in 19th Feb 2019. In May it will conduct the first phase of the exam in this UPSC Civil Services Selection Process called the prelims exam. This Mains exam is the objective questions exam paper with two papers. Both papers qualified hopefuls will get the eligibility to write the Prelims Exam. This UPSC Civil Services Mains exam is the descriptive type. All the papers well-attempted candidates may receive the UPSC Civil Services interview call letter. Thus three rounds given candidates may get the chance of obtaining this UPSC job. Candidates who can apply for this UPSC IAS and IFS Recruitment 2019 those candidates can refer here for more details and also application links. 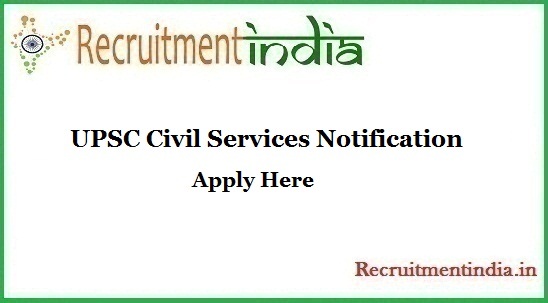 The post UPSC Civil Services Notification 2019 | Apply Online For 800 IAS/IPS/IFS Vacancies @ upsc.gov.in appeared first on Recruitment India.